Cross-posted from The H Word blog, first appeared 15 April 2013. 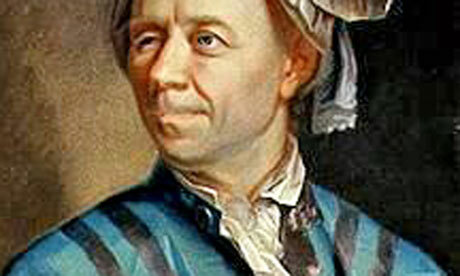 Euler was arguably the most important mathematician of the 18th century and one of the greatest of all time. He introduced most modern mathematical terminology and notation and was also renowned for his work in mechanics, fluid dynamics, optics, and astronomy. What is not noted, but is well-known to those of us working on the history of the Board of Longitude project, is that Euler is one of those who received a financial reward from the Board in 1765. In the aftermath of a sea trial of three possible approaches to solving the problem of finding longitude at sea, two emerged as worthy of further investment. One was John Harrison’s sea watch, for which the maker received £7500 in October 1765. Any further reward would depend on his showing that this was a machine that could be replicated. Back in May 1765, however, the Board also worked out how to reward and support the lunar distance method. This, much more obviously than Harrison’s work, was a method produced through the work of many individuals, several already deceased. However, as well as setting up the future publication of digested astronomical data in the form of theNautical Almanac, they opted to flag up some key contributions. Tobias Mayer’s widow, Maria was paid £3000 as a posthumous reward to her husband “for his having constructed a Set of Lunar Tables” and to her for making them property of the Commissioners. Catherine Price, Edmond Halley’s daughter, was paid £100 for handing over several of Halley’s manuscripts, which the Commissioners believed “may lead to discoveries useful to navigation”. 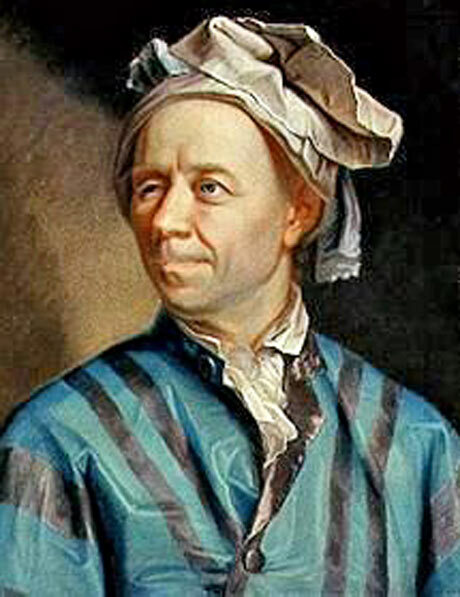 Still living, however, was Leonhard Euler, who received £300 “for Theorums furnished by him to assist Professor Mayer in the Construction of Lunar tables”. Euler’s important mathematical work had very practical applications, of which he and the Board were well aware. It was this work, building on that of Johann Bernoulli and Gottfried Leibniz that allowed Mayer to do what had always eluded Isaac Newton: produce a usable theory of the moon. 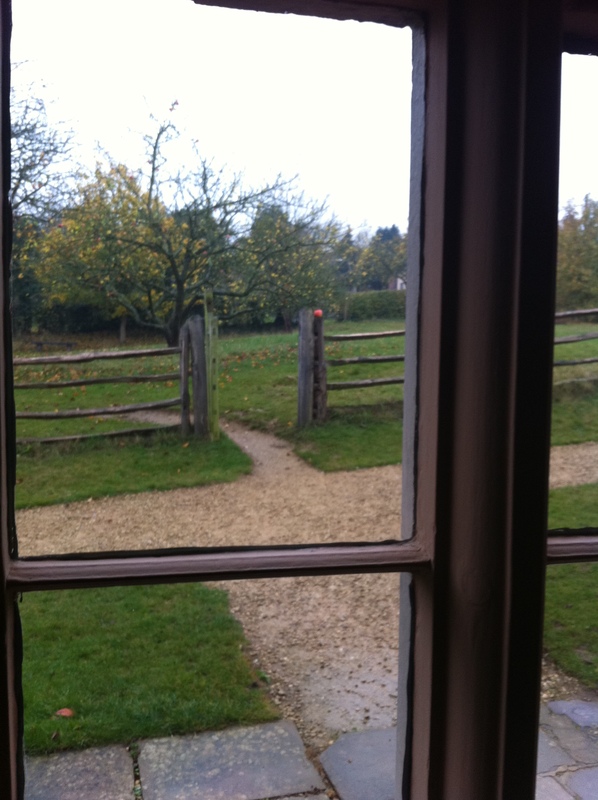 Recently, on an evocatively misty day, I finally had the chance to visit Woolsthorpe Manor, the National Trust property that was once Isaac Newton’s family home. It was, you might think, high time I did so, given my interest in Newton’s posthumous reputation and Woolsthorpe’s role in Newtonian folklore. Reverence for the man has long sparked interest in the place: it is not only Newton’s place of birth and where he grew up, but the theatre in which he set the account of his annus mirabilis. The darkened room in which he placed his prisms. The apple trees that sent his thoughts to the moon. The rural quietness that allowed his fluxions to roam free. Of course, it would seem that Newton was also profoundly unhappy at Woolsthorpe, at least before he returned as a university man. He was unsuited to the life of a yeoman farmer, by all accounts, and, at least occasionally, wished ill toward members of his Lincolnshire family. It is the result of accident – the arrival of the plague – that Newton, at the height of his “inventive genius” in his early 20s, could situate his series of significant strides here rather than Cambridge. While relative solitude and free time might have been a factor (on a farm? with your parents and siblings? ), we should remember that much work before and after was required to develop these ideas. Intentionally or not, by highlighting his exile Newton presented his achievement as purely the result of his own, unaided genius. 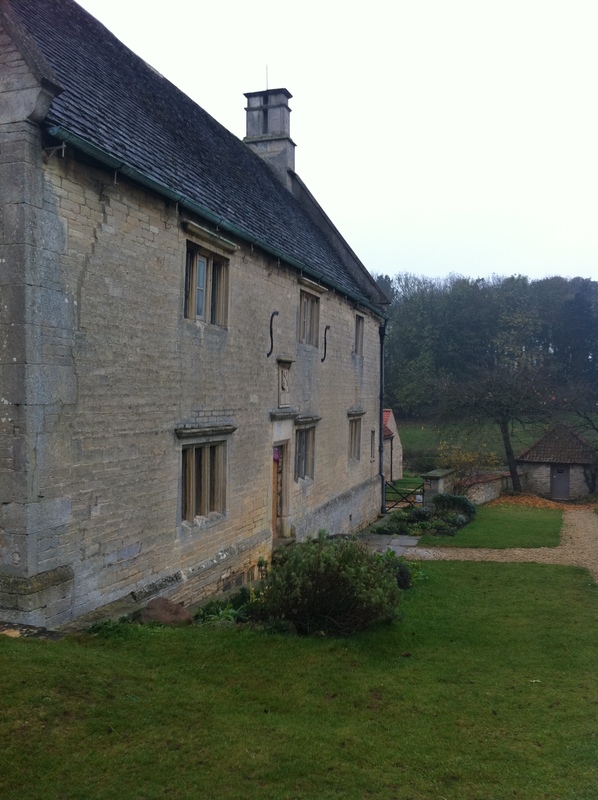 Woolsthorpe Manor, as a museum, reflects this mixed story. Initially, there is little of Isaac to greet the visitor. The rooms are dressed as appropriate to a 17th-century farmhouse, with thanks to the V&A’s collections, and guides and educators are able to talk visitors through historic domestic arrangements. Upstairs, however, there are displays about Newton’s life and work, which of course largely took him away from Lincolnshire. 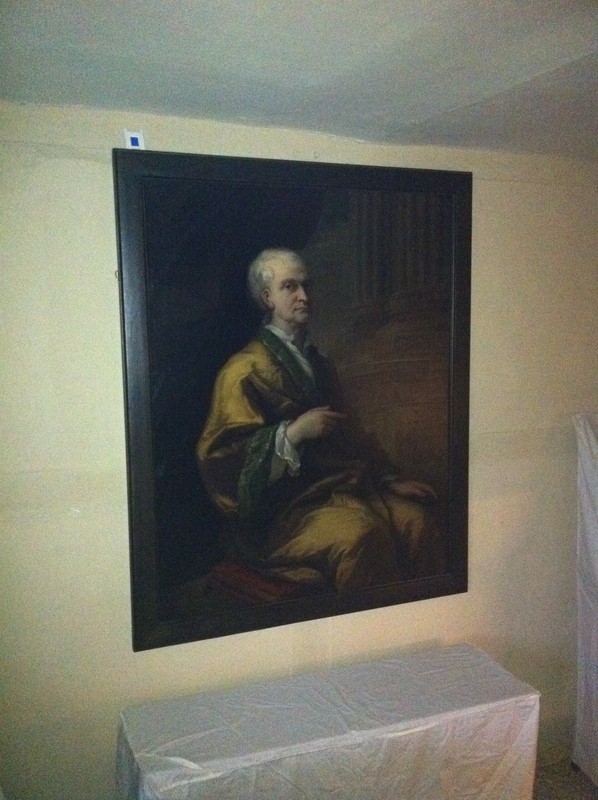 We get a roomful of text panels (up, I believe, for renewal soon), a hint of Newtoniana and a large Thornhill portrait of the elderly Newton, acquired in 1994, which looks slightly out of place in the comfortable but modest building. Among the outbuildings, however, is a rather shiny-looking ‘Science Discovery Centre’, in which the principles behind Newton’s most famous discoveries are laid out. While largely, in science centre style, this puts the science across without context, the text and illustrations in the room continue to present the historic Newton. Rather nicely, some of the stories that William Stukeley collected in and around Grantham after Newton’s death are presented, including a model that might look something like the model windmill that Newton was said to have built, complete with the mouse-‘miller’ that was supposed to turn it. 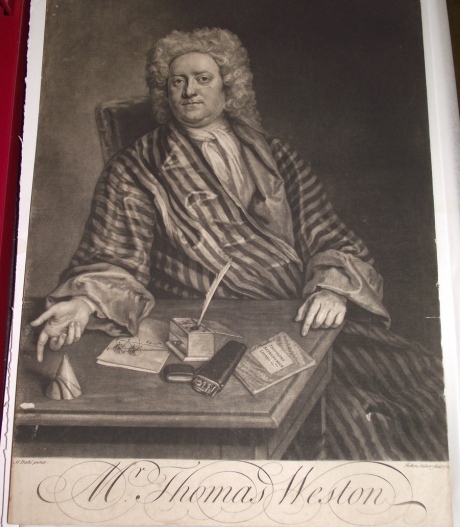 The accounts of the youthful Newton that Stukeley collected were sent to Newton’s nephew-in-law, John Conduitt, for a planned biography that never saw the light. 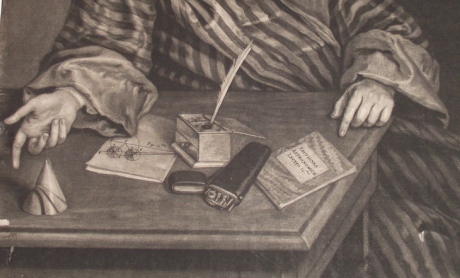 Along with other reminiscences, they can be found on the Newton Project website here, as can the 1750s Memoir of Newton by Stukely, which also went unpublished (until 2006). Despite the richness of the tales -told many, many years after the events – Stukeley’s information rested in the family archives for the next eighty years until published in a tome of local history, called Collections for the History of the Town and Soke of Grantham, in 1806 by one Edmund Turnor. MP, Fellow of the Society of Antiquaries and Royal Society, Turnor was spurred to publish by his family connection to the locality, and to Woolsthorpe itself: the family had purchased the Manor in 1732. Edmund’s brother Charles had also felt the urge to collect, celebrate and publicise his connection to Newton, presenting several volumes of Newtoniana to the Royal Society in the 1840s. The Turnors, we must assume, were happy enough to greet scientific pilgrims who came to their door or, at least, to their orchard. Jean-Baptiste Biot was one such, who recorded that he had gathered a few leaves from the famous tree. Even David Brewster, who was unconvinced by the apple anecdote itself, was recorded in his daughter’s biography, to have seen “the celebrated apple-tree” in 1814 and “brought away a portion of one of its roots”. This seems a trifle destructive, but may be a result of the exposure of the roots after the tree was blown down at some point before 1816. In general, the amount of wood taken and used in the form of snuff boxes and other trinkets would seem – like the true cross – to be enough for several trees. And yet the tree, or a 350-year-old tree (see this history and analysis), appears to have survived, a new growth, like Joseph’s staff, having sprung from the felled tree. Forgive the slightly blurry image: the light was poor and the camera was a phone. Forgive, too, the biblical and religious imagery here, but it something that this story seems to conjure up, as Patricia Fara showed very well in her Newton: The Making of Genius. Like Brewster I have my doubts about the story (see this discussion in the comments of a previous post) but I too could not resist when there. The following shot, from inside the Manor, was clearly set up by some National Trust employee. Experiment in the hands-on Discovery Centre. Be inspired by the house where a genius grew up. Contemplate the apple tree with a place in history. I can’t admit that I did the first two – the visit was brief and the house closed to the public, so there was little chance for hands-on and some of the furniture and props were packed up (literally, in bubble-wrap in one case). I am not sure that the rooms, however presented, could really make me feel the presence of the geni loci. This list also does not give due to the house’s role as a rather humbler property than many historic houses, which allows visitors a glimpse of life among a class other than the nobility. Particularly memorable were the cubby-holes in the wall next to the chimney, where wigs could be kept aired, and the markings outside one of the doors, intended to deter witches. 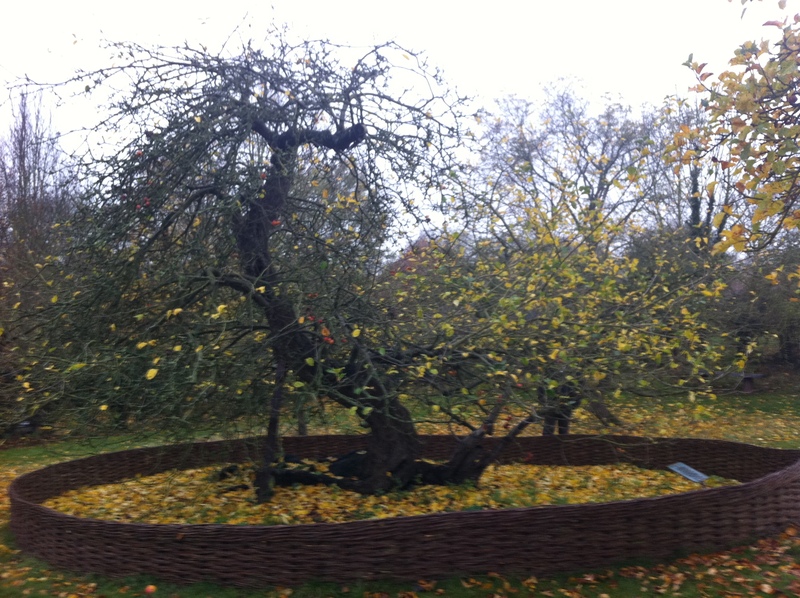 However, I certainly did contemplate the apple tree with a place in history. Not, perhaps, to think about “Newton’s passage from a falling apple to a falling moon” – a “leap of the prepared imagination” – as Tyndall put it, but to consider how and why the tree got that place, and retains it, even with sceptics like Brewster and me.